Evan Ziporyn | Will You Miss Me When I'm Gone? When Evan Ziporyn recently left the Bang on a Can All-Stars, it seemed to us that there was inly one player who immediately came to mind as a replacement: Ken Thomson. We met him when he was working for Bang on a Can’s Cantaloupe record label. But we quickly discovered what a fantastic, versatile wind player and composer he is. You might know him as the peripatetic sax-playing leader of Gutbucket, or a leader of the Bang-Lincoln Center Out of Doors marching band, Asphalt Orchestra. No matter how you know him, you know he’s up to the challenge of filling Evan’s shoes and taking the All-Stars to the next level. Congratulations to Ken. Well done. We are thrilled to welcome high voltage clarinetist Ken Thomson to the Bang on a Can All-Stars! This past year, during our national search, we played with stunning clarinetists from all over the country. We were honored to share the stage with so many great performers. After a search far and wide, in the end we came back home to one of our own. Ken has been a part of the Bang on a Can family for many years. As a founding member of Asphalt Orchestra (our rad street band) and as faculty at the Bang on a Can Summer Festival at MASS MoCA, Ken has graced us with his dynamic and physical performances. He has already jumped right in with a European tour taking place right now through Belgium, Sweden, the UK, and Iceland, to be followed by his first home-town performance as an official All-Stars at the Bang on a Can Marathon on Sunday June 16. 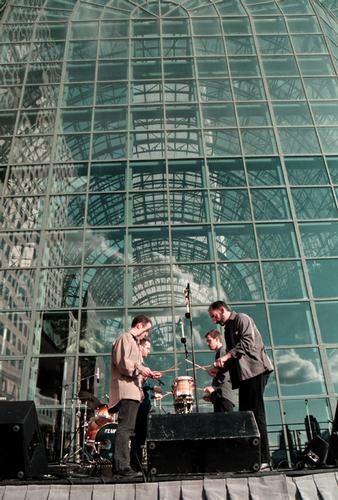 Talujon Percussion Quartet at the World Financial Center Winter Garden. Bang on a Can/Cantaloupe Music and the Noguchi Museum are hosting Second Sundays, an awesome concert series on the second Sunday of each month through September. Will You Miss Me When I’m Gone? missed the inaugural gig, a performance by French avant-pop composer and bassist Florent Ghys — catching him instead at the Bang on a Can Marathon later in the month. The series continues this Sunday, July 11, with a set by the amazing Talujon Percussion Quartet. To get a good sense of this group, check out the sound samples posted here. 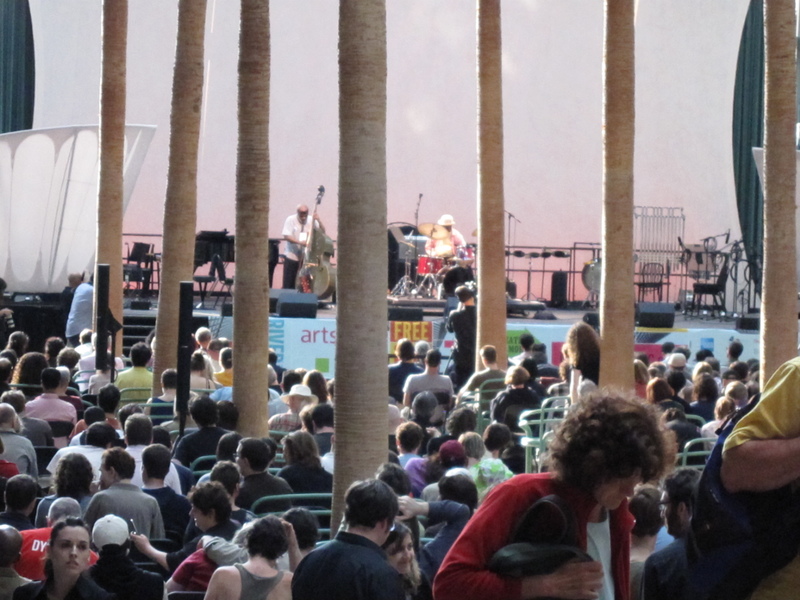 Master clarinetist Evan Ziporyn will take the garden stage in August, while one-bit electronics composer Tristan Perich closes the series in September. Shows are at 3 p.m. on the second Sunday of the month in the garden of the Noguchi at 9-01 33rd Road (at Vernon Boulevard), Long Island City. It’s the former workshop of Japanese-American sculptor and visionary Isamu Noguchi that is now preserves his artistic legacy. The concert is included with museum admission, which is $10 for adults. Every year, the Bang on a Can Marathon brings a wide range of new music and spectacular performers to New York City to perform in a massive free concert — and this year is no exception. The Marathon is coming up in just two weeks, from noon to midnight on Sunday, June 27, at the World Financial Center Winter Garden at 220 Vesey Street in Lower Manhattan. 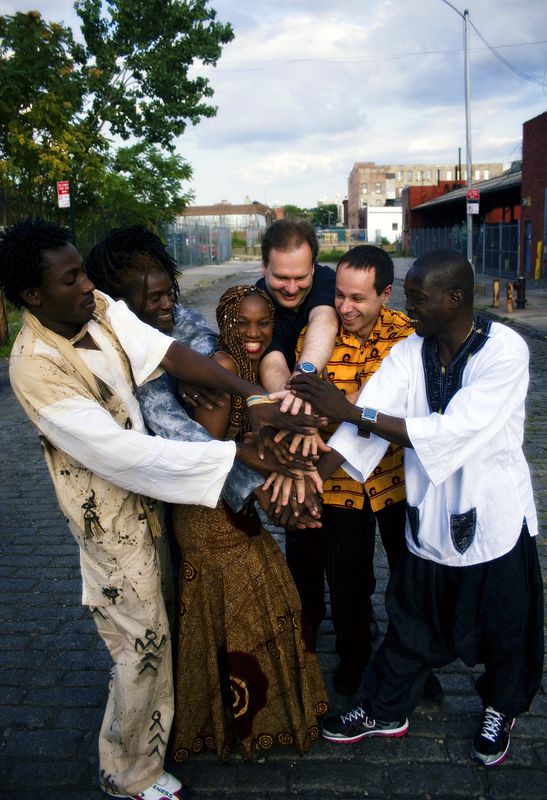 Burkina Electric, an African band organized by composer Lukas Ligeti (second from right) is just one of the great acts at the Bang on a Can Marathon. This year’s program will, as always, feature Bang on a Can’s house band, the Bang on a Can All-Stars, and a host of other great acts, including Living Colour’s eclectic guitarist Vernon Reid, African band Burkina Electric, John Hollenbeck Large Ensemble, Signal ensemble and Gamelan Galak Tika. Bang on a Can has been presenting these marathons since 1987 at various locations around NYC. Since moving to the WFC, thanks to the generosity of co-presenter Arts World Financial Center and the River to River festival, admission has been free. The Marathon turns the Winter Garden into a big, 12-hour party, with people coming and going and the mood shifting with the performers and the changing natural light pouring through the glass walls. Click here to check out photos and coverage of last year’s Marathon by Will You Miss Me When I’m Gone? Click to the jump for the full list of performers and schedule.